Hello @markop sorry i did not understand Blynk.run(); should be removed or keep. Hi @Gunner Thanks for the help but I am unable to understand how timer will work can you please help me with my code. @chinusabya Don’t forget to search around this forum as well as reading all the related documentation… BlynkTimer is based off of the Arduino SimpleTimer Library. Dear @Gunner my node mcu is not keeping eeprom value after reboot can you please help me on that. I just had a quick skim through your code and you don’t appear to be retrieving the EEPROM value at startup. Shouldn’t you be calling the read function in your void setup? Also, are you aware that each EEPROM memory location has a limited life in terms of the number of writes it can endure? The manufacturers say that they’re good for at least 100,000 writes, but as you’re doing at least one write each time your void loop is processed then I’d expect you’ll “burn out” your chosen memory location within a matter of minutes. Hello @PeteKnight thanks for going through my code i am really a beginner in this but trying my level best to understand how code works,yes i do understand that node mcu can handle only 100,000 write cycles but I can not find a way to avoid that. I have to write value to eeprom through blynk slider only 2 or 3 times a year. ,yes i do understand that node mcu can handle only 100,000 write cycles but I can not find a way to avoid that. better yet if you throw that into a timer, say you do that check every second, so if you ‘slide’ the slider you do not write each. and. every. slide. step. you. do. Yes, that’s the function that reads the EEPROM value, but it’s never called in your code, so the value is never retrieved from memory. There’s actually no need to use EEPROM memory at all. The value of the slider is stored on the Blynk server, you just need to do a Blynk sync at startup to retrieve that value. char auth = "xxxxxxxxxxxxxxxxxxxxxx"; //Auth Token in the Blynk App. char ssid = "xxxxxxxxx"; // WiFi SSID. char pass = "xxxxxxx";  // WiFi Password. But got another problem unable to turn relay on off with blynk button as timer reset every second please help me on this issue. void checkTimer () <<< z.b. @chinusabya keep using the BlynkTimer as recommended, but either use a 2nd timeout Timer to turn the Relay off. Or run a 2nd interval timer every 1/2 second. Adjust timers as wanted. Actually it is hard to tell what you are trying to do … but BlynkTimer is the better way regardless. SET Light On time- Slider to set delay for relay to be kept on after pir has detected motion. 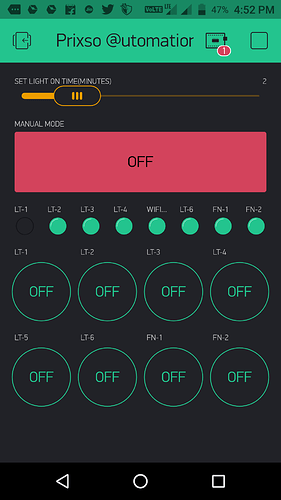 Manual Mode- To turn on/off pir detecting motion. 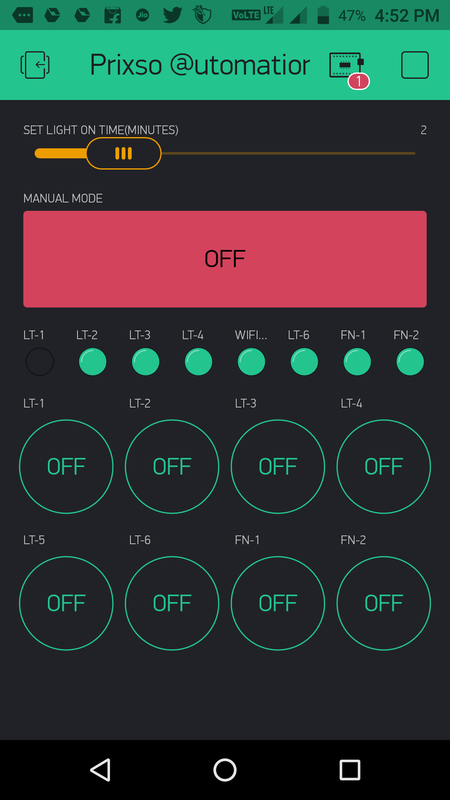 LT1…LT2…- To turn the relay on/off through button. When this runs it turn the relay off which were turned on by blynk button. char auth = "xxxxxxxxxxxxxxxxxxxxx"; //Auth Token in the Blynk App. char ssid = "xxxxxxxxxxx"; // WiFi SSID. char pass = "xxxxxxxxxxxxxxx";  // WiFi Password. rking but Blynk app gets offline every time sensor detect presence. So you have better control over BOTH cases. Now you’re doing: IF this particular situation is met THEN turn it on ELSE in ALL other occasions turn if off. Which it seems is not something you want.